Being a photographer on assignment to photograph a celebrity is somewhat like being a hit man. The difference is that the hit man is hired to shoot to kill and the photographer is hired to shoot for posterity, or some kind of publicity. Through the last decade my photography has crystalized into working almost exclusively with people in the creative and performing arts. A large number of them are household names. Those who aren’t think they are, so my working techniques are the same for both groups. Celebrated subjects are really not that much more vain than the average person, but pictures of themselves are more important to them. A widely published photograph can seriously affect a public career, particularly a performer’s. 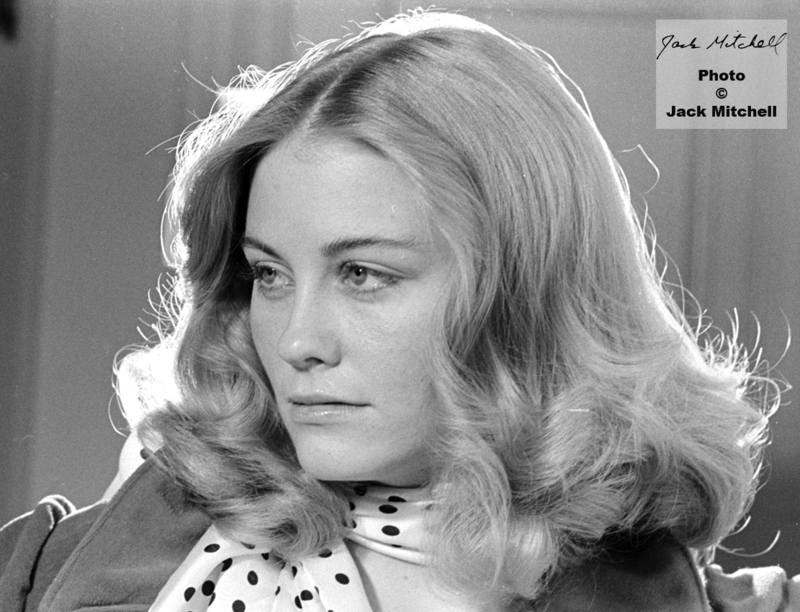 I remember Cybil Shepherd asking me to use a halo light behind her hair because she was interested in getting a Clairol commercial. Women do not have an exclusive right to vanity. Men too care about how they look in photographs. Director Mike Nichols, after I had set up a wide angle shot of him asked me to change places with him so he could look through the viewfinder and see if there was any distortion of his face. Often photographed people are aware that a wide-angle lens can crucify their face, making their nose appear larger if the photographer is inexperienced. I only use a wide-angle lens to manipulate backgrounds and show a subject in context. I would never deliberately manipulate a person’s attractiveness just to create an effective picture, even though my mother encouraged me as a teenager to make people pretty so that they would buy more prints. My aim is to make an honest, compassionate, compositionally beautiful and upbeat picture of my subject. Stars are so conscious of their good and bad features that they are aware instantly when a photographer begins to light and pose them to accentuate their good features. This makes them feel more relaxed and comfortable than anything you could say. 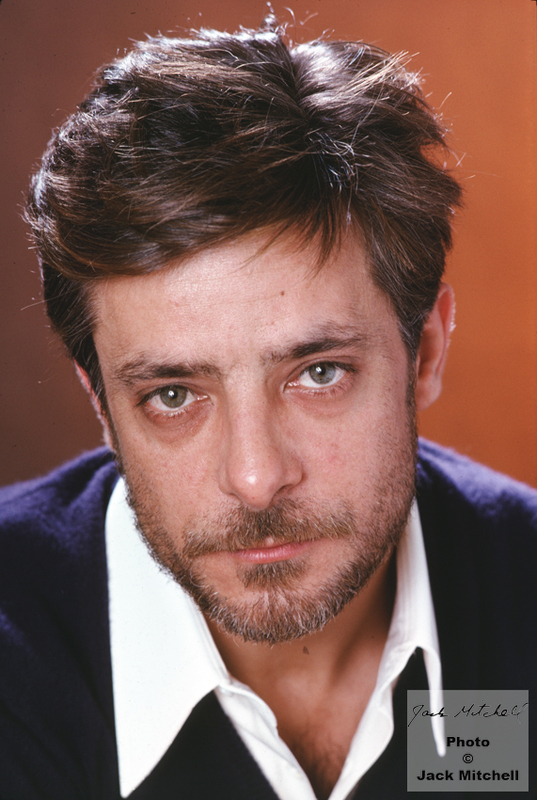 After lighting and photographing Italian actor Giancarlo Giannini for ten minutes he remarked that I had discovered all his acting secrets. Professionalism can sometimes be mistaken for vanity. Assigned by the New York Times to photograph the four principal singers in the New York City Opera production of “Maria Stuarda”, I went to the theatre armed with four sketches of composition ideas I had developed by studying the opera libretto. The opera director Tito Capobianco was there for the shoot and had his own ideas for the picture. Being younger and politer, I agreed to do his proposed idea before mine. 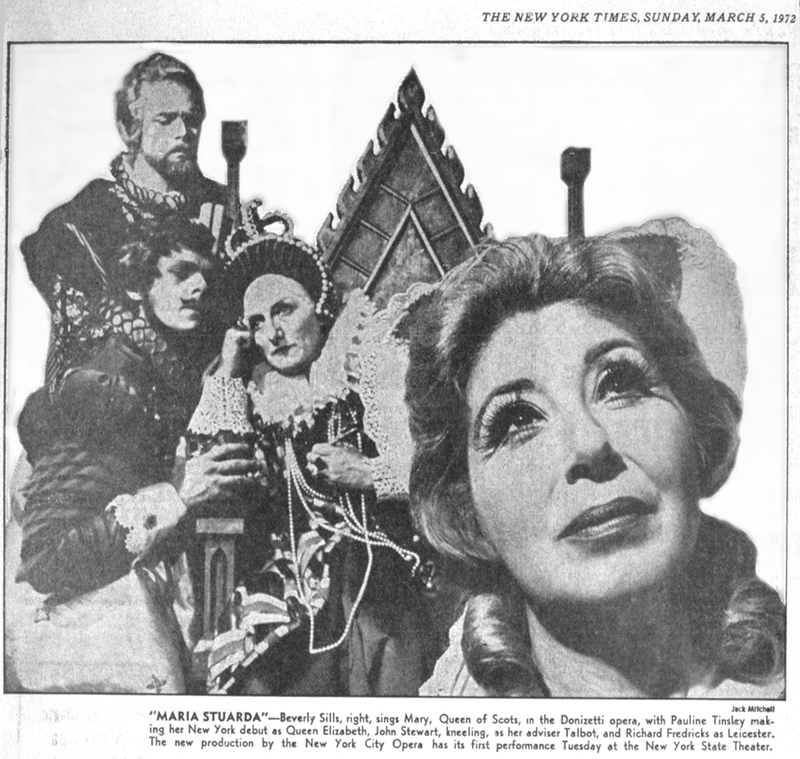 His concept was to show Pauline Tinsley as Elizabeth I in close up on her throne with the tenor and baritone at her side, floating in the upper right darkened background he place Beverly Sills who was starring as Mary Stuart. It was meant to convey Elizabeth thinking of the troublesome Mary. I set up the shot but before I could click the shutter, Beverly said, “Wait a minute, this is not right! The name of the opera is ‘Maria Stuarda’ and that’s me! I should be up front!” She got down from the chair in the background and I immediately set up one of my sketched out pictures, Beverly in the foreground, prayer book and rosary in hand. Now it was Mary Stuart in the foreground thinking of her nemesis Elizabeth who was glowering at her in the background flanked by the tenor and baritone. Beverly Sills’ refusal to go along with Capobianco’s idea was not about personal vanity. She knew what was right conceptually, and she is professional and very vocal. Careful preparation before a shoot is absolutely essential for me. I still get nervous before any session, akin to stage fright. I can appear cool and ready only if I know exactly how I am going to approach the session. For any session involving two or more persons I always sketch out my ideas, noting the focal length of the lens I intend to use. Once into the session I improvise and do variations and invent on the spot. It is necessary to be a director as well as a photographer in order to produce dramatic pictures. Preparing for solos sessions is easier. I just make notes on what qualities I want to emphasize, including pluses and minuses. If I do not know a subject and have never seen their work I question their press agent in detail. I do refuse to see a screening of a new film release just before photographing the star of the film. First of all I cannot disassociate the actor from the character and secondly, not having seen the film allows the star to tell me how great it is. If I have seen it I may know it is no good. While careful preparation for a session is a big plus in establishing a rapport with a subject, lack of communication can also produce rewarding results. 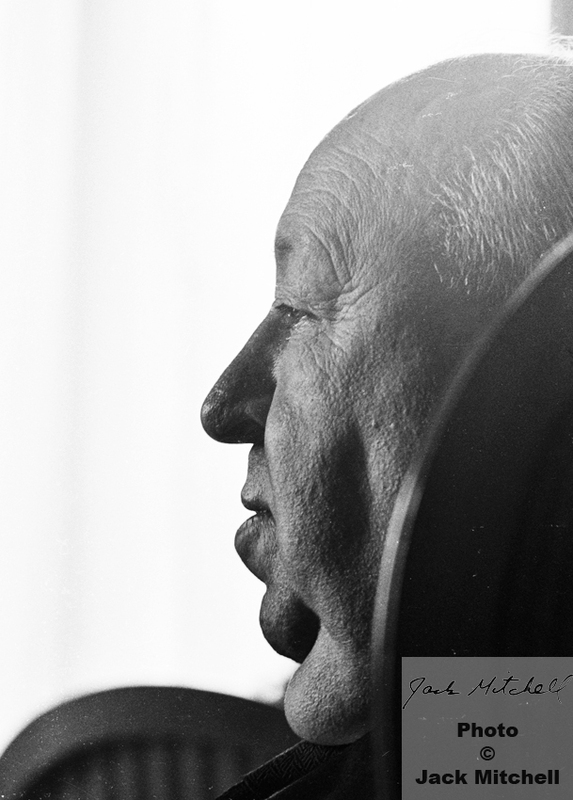 I had to photograph Alfred Hitchcock in his hotel room while being interviewed by New York Times film writer Guy Flatley. There was no time in his schedule for a separate session. Hitchcock concentrated on the interview questions and virtually ignored me, allowing me to move around him and photograph him as though he was a piece of sculpture, the resulting portrait resembles Mount Rushmore. 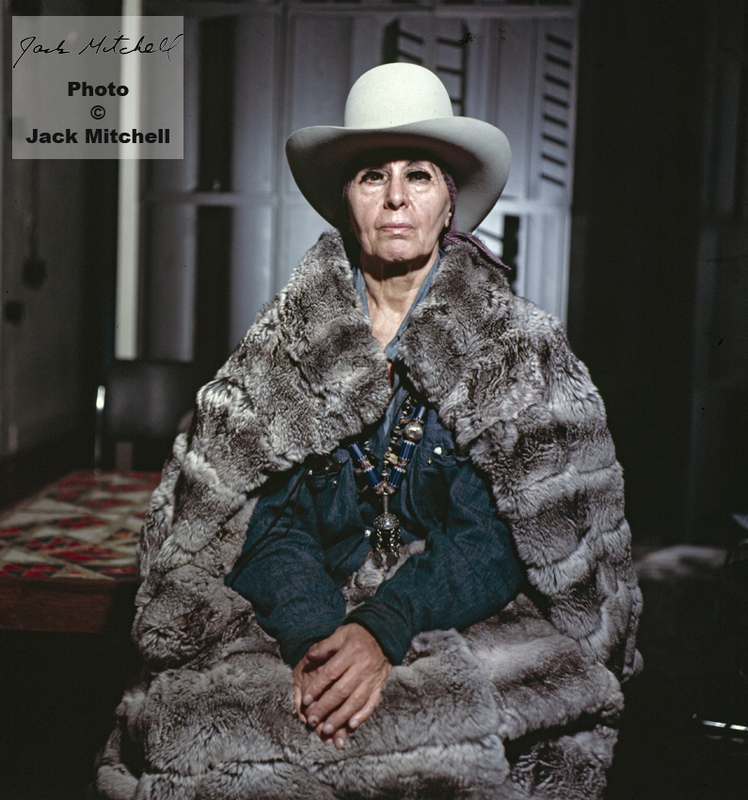 Besides the obvious pleasures of working with gifted and celebrated people there are many wonderful off camera moments, like watching Louise Nevelson pull one of her sculptures away from the wall, reaching in behind it and producing a bottle of Whiskey and glasses to offer a drink; violinist Eugene Fodor doing a mini-performance for my studio cats to see their reaction to the selection his cats like most; Dame Joan Sutherland telling me how to make my African violets bloom; playwright Terrence McNally telling me the story of his gay bath house comedy ‘The Ritz’ before he had finished writing it. These memories are numerous, treasured and growing. Each night I vacuum the stardust from my head to clear it so I have a level headed approach to tomorrow’s celebrity. They do come and go.